(7) CSI Division 03 Concrete Inspection Forms w/checkpoints. Fully-written plans range in size between 30 pages and over 200 pages. 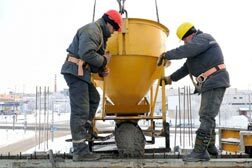 Good for all ready-mix (poured) concrete construction projects including pavement, structures, and flatwork. Concrete quality plans, programs and manuals are available for civil/commericial/industrial and government projects including USACE/NAVFAC, FTA-DOT, DOE, FHWA, or other government agencies' standards as well as ISO 9001 and ISNetworld requirements. We'll assemble a concrete quality plan, program or manual based on your contract specifications and personalize it with your company, project, and scopes of work information. See template personalization for more information. Don't want to download a sample, contact us at 410-451-8006 and we'll answer all of your questions.